There are tons of mobile apps out there for the gaming logophile, but there's a new word building game taking over iPhones and iPads, and it not only wants you to have fun, it wants you to fight back in the "war against words". It's the Word Examination Laboratory for Dynamic Extraction and Reassessment. But you can just call it W.E.L.D.E.R. Since its release earlier this month, W.E.L.D.E.R. has developed quite a following with its addicting mesh of Bejeweled, Boggle and Scrabble gameplay. 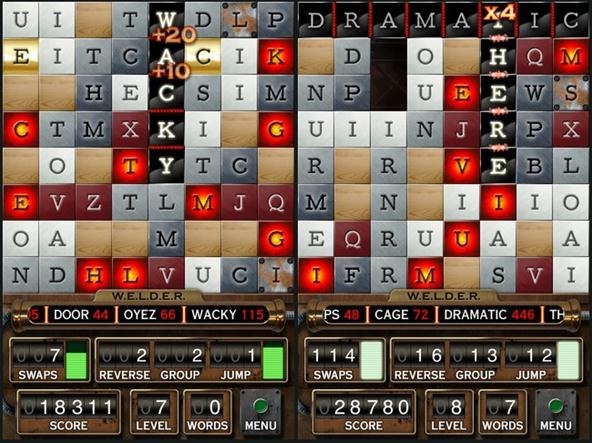 It's very similar to something I played in the Android Market called Dropwords (previously Word Drop), which also combines aspects of those three word games, only W.E.L.D.E.R. does it way better—and looks way better. The grid in the W.E.L.D.E.R. machine contains 64 tiles containing metal letters worth between 1 and 8 points each, wooden blanks that can be stamped with any letter, and multiple bonus point spots—just like Scrabble. The goal is to form words that are four letters or longer by swapping adjacent letters—similar to playing Bejeweled, but with an end result more like Boggle. It will then "dynamically extract" the word and drop it into the Word Tube for "reassessment", which lets you look up the definition and share the word with your friends. Tested.com's review of the game. If you want to snag the W.E.L.D.E.R. app from Ayopa Games, do it now, because it's currently only $0.99 in the App Store for iPhone, iPad and iPod touch. It will resort back to its $3.99 price tag after Thanksgiving. W.E.L.D.E.R. is only for iOS devices right now, but like I mentioned before, Dropwords is a very similar game for Android users.